I get the urge to start baking with yeast in August. In late August the humidity in Kentucky eases up and the temperatures fall slightly. The slight change in temperature always makes me think about hearty soups, yeast rolls and bread for Fall. 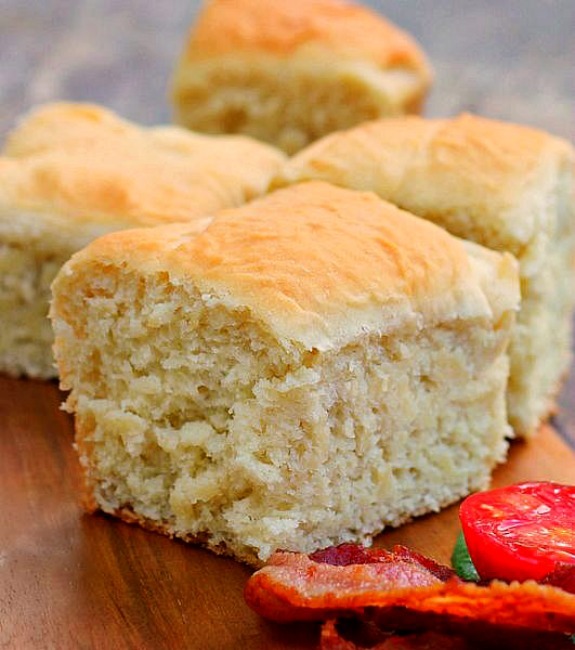 Buttermilk Yeast Rolls are hearty yet very very tender and fluffy! After the dough is made and risen the first time you press it into a greased 9 inch baking dish. I loved this part, no little balls to roll! The dough is cut with a knife to form the individual rolls, the recipe yields 12 rolls, I decided to make mine a little larger and cut them into nine rolls. Nine rolls gave me a slightly larger roll that was just the right size for Paul. He could make a small breakfast sandwich with them in the morning if he chose to. It worked out perfectly. You’re going to love everything about these yeast rolls ,from the ease of making them to the wonderful texture and flavor. These are a keeper, ENJOY! In an electric stand mixing bowl combine yeast, 1 cup flour, 1 Teaspoon salt, 2 Tablespoons sugar and 1/2 Teaspoon baking soda . In a medium size metal sauce pan combine water, buttermilk and oil. Heat to 120 degrees. Add the heated ingredients to the flour mixture. Beat 4 minutes on medium speed. With the mixer on low speed gradually add enough remaining flour until you have a soft dough. Knead with a bread hook until smooth. The dough will be soft and supple. Place the dough in an oiled bowl, turn to coat the dough, cover with a clean cloth. Place in a warm oven, turn oven to lowest temperature and let heat for 1 or two minutes then turn it off. Place the dough in the oven for 15 minutes to rise. After dough has risen press the dough into a greased 9 inch square baking pan. Lightly sprinkle flour over top of the dough, with a sharp knife cut the dough into 12 rolls, cutting almost to the bottom of the pan. Cover and let rise in a warm place. It has risen enough when you touch the dough with your finger and the indentation from it remains. Bake in a preheated 400 degree oven for 15 – 20 minutes or until the roll tops are golden brown. Remove the rolls from the pan, serve. Thanks for baking our recipe! Your rolls look delicious!! Your are so welcome!! They’ll be more recipes coming from Red Star Yeast as the weather cools! Hi Dodie, the recipe is down the post farther, were you trying to print them out? Hi Bunny. Just stopping in to say that I made these yeast rolls and we loved them. They are posted on my blog the Wednesday baker.blogspot.com. They will be a keeper for me. Thank you for posting to Pinterest. That is where I saw them first. I have linked back to your post. Thank you Andi, I appreciate it! thanks, looks easy and will be making them soon. I hope you do Kathy, you’ll love them. Just made this recipe tonight, I’ve always had a difficult time making yeast rolls until now, love the easiness of this recipe, tastes great too. Thanks for sharing this awesome recipe! You’re so welcome Patricia! Thank you for coming back to tell me you made it! You made my day!